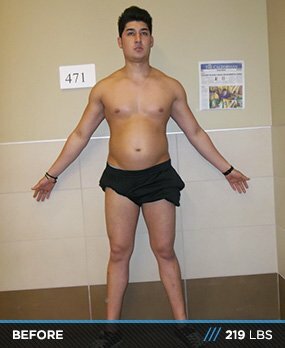 Body Transformation: Channeling His Inner Zyzz! Doubt and denial became fuel when Alex stepped into the gym, lost 57 pounds, and formed a new life. 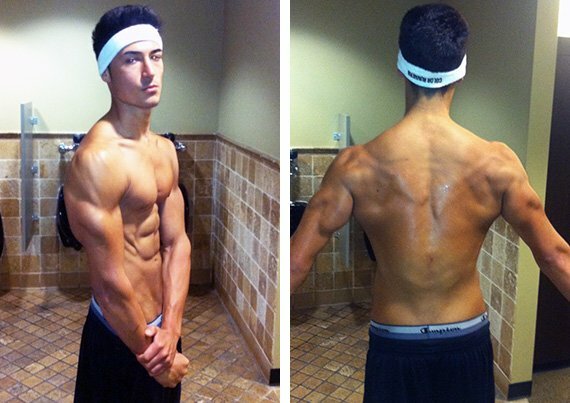 His goal was simple: to look like Zyzz and emulate his outlook on life! I was a very active person in average shape until I got two jobs and started to gain weight and lacked energy. It got to the point that I was tired of being tired and wanted to change. I started looking up workout and inspiration videos on YouTube, came across "Zyzz - The Legacy," and became more inspired than ever. I went to my local Gold's Gym, got a trainer, and was willing to do anything to achieve an aesthetic physique like Aziz Shaversian (aka Zyzz). I set a goal to completely change my life and get as close to his physique as possible in 12 weeks. I told my parents' trainer and friends and they all laughed and said "Yeah right! That's impossible in 12 weeks. It sounds awesome, but you should be a little more realistic. It's pretty hard to lose that much weight in such little time." After telling everyone about my goal and hearing the feedback, I became angry that nobody had faith in me. I gave up my horrible eating habits and quit partying every night after work and being a couch potato on my days off. I invested in biking gear and fixed my bike to use as cardio because I enjoyed long rides. I used my built up anger and started lifting as hard as I could and felt great after my workouts. I biked for an hour after training and was content and happy for the remainder of the day. Since I wanted to lose weight and gain muscle without preparing complicated meals, I figured to keep it simple and drink protein shakes every day until my protein intake was met. I also started taking a multivitamin and drank a gallon of water per day. Within three weeks, I lost 21 pounds and started to see awesome results with a developing six pack. Everyone who doubted me noticed my results slowly gained faith in me. Around week five, I got sick of my diet and thought about quitting because I had good results. Then I reminded myself that this mission was to get as close to Zyzz's physique as possible and I wasn't close to it. I also didn't want to be a quitter because quitters don't get anywhere in life. So, every day I lacked motivation, I played "Zyzz - The Legacy" and was motivated again. My goal was to drastically cut weight and build muscle, so I kept my diet around 1,500 calories per day with 200-plus grams of protein, mostly from protein shakes. When I absolutely needed a cheat meal, I ate one serving of homemade popcorn using coconut oil to pop the seeds. The popcorn added up to 100 calories and satisfied my craving. This is what my diet consisted of for 12 weeks! The most challenging aspect was my diet. Protein shakes don't taste great after drinking them for 12 weeks straight, but I knew it wasn't going to be easy so I dealt with it and got used to it. Now that the fat is off my body, I plan to do a clean bulk and get up to 220 pounds with 8 percent body fat. I also plan to become a certified personal trainer and compete. Haters are going to hate, so let them motivate! Don't underestimate yourself. If you want something, go and get it. Dedication and discipline are key. Get uncomfortable; no pain no gain! Embrace the burn, pain, and soreness because it makes you stronger. If you see results, keep doing what you're doing and remember that slow progress is progress. Bodybuilding.com provided workouts that I wanted and needed. My workout was based on what I saw on the site. I would've had no idea where to start if it wasn't for the awesome information on Bodybuilding.com.